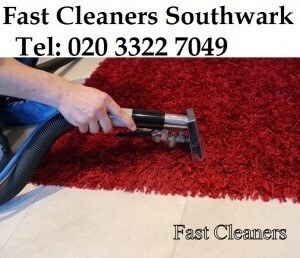 Fast Cleaners offers the most efficient carpet cleaning service Southwark at reasonable prices. With the best carpet cleaning products and machines, we are fully equipped to handle all sorts of carpets of different sizes. We do not let our clients pay pool carpet cleaning charges but let the type and size of the carpet determine the cleaning cost. This enables us to offer cheap cleaning prices that are determined by the amount of cleaning offered. Our trusted rug cleaning services have enabled our company to grow its client base due to quality cleaning practices. Our cleaning company offers numerous carpet cleaning services depending on our client’s needs. This includes the regular vacuuming to remove loose dirt, weekly or fortnight shampooing and conditioning to remove dirt that has become seated on the carpet, and deep cleaning which involves the use of heavy steamers to remove the deep seated dirt. Deep cleaning is usually carried out annually or biannually. We also offer carpet stain removal services to remove carpet stains that are not easy to remove. There is much more to cleaning a carpet than just washing it. The cleaning method should be looked into to ensure that the carpet is not damaged during cleaning. There is also a need to finish off the cleaning with maintenance to ensure that the carpet will dry off looking as good as new. Our staff offer carpet rejuvenation services after the cleaning to leave the carpet looking as good as new. The loving care given to our client’s carpets has been able to build our name in offering top notch carpet cleaning services. Our lines are open 7 days a week, so don’t hesitate to give us a call on 020 3322 7049.